Community ecology is often described as a messy sub-discipline of ecology1,2 likely due to the myriads of potentially important spatial and temporal drivers that may explain how species assemble within communities and coexist. This vision of ecology contrasts with the pervasive idea that there might be some general rules that govern communities and ecosystems3–5. This question is important because it may determine our ability to understand and predict the functional consequences of biodiversity loss that all ecosystems are currently experiencing. Drylands cover 45% of Earth’s land surface7 and are highly sensitive to global change which in the most dramatic cases can lead to desertification8 (Figure 1). Plant diversity have been shown as a key driver of ecosystem functioning in drylands from local9 to global10 scales. However, we do not know how much plant diversity are needed to sustain ecosystem functioning. Quantifying the relationship between plant diversity and ecosystem functioning is directly relevant to guiding management efforts aiming at maintaining key ecosystem services such as food production and climate regulation (which are strongly dependent on ecosystem functions such as plant productivity and nutrient cycling) in drylands, which currently support over 38 % of global population. Figure 1 Dryland in southern Spain (Almeria). These ecosystems are predicted to pass tipping points to desertification in future climate change scenarios6. In our study, we aimed at characterizing the distribution of attributes observed within plant communities and to link them to ecosystem functioning. Initially, our idea was inspired from fisheries where the distribution of fish attributes (body size and age) is used as a proxy of stock sustainability11. When juveniles are overrepresented within fish communities, it becomes critical to adjust the pressure from the fishing industry. Applying to drylands, we aimed to test whether the distribution of two key plant attributes associated to plant form and function12 - maximum plant height and specific leaf area – could be used as indicators of ecosystem functioning. We were interested in the shape of trait distributions (i.e. skewness and kurtosis) as indicators of species co-existence and plant trait diversity and how it is influenced by climate and soil factors13. The skewness has been for long associated with asymmetry for light competition, or transient response to environmental changes14. Kurtosis reflects the evenness of the distribution and low kurtosis in the trait distribution can be interpreted as a sign of coexistence between plants14. Figure 2 Screenshot of the discovery. 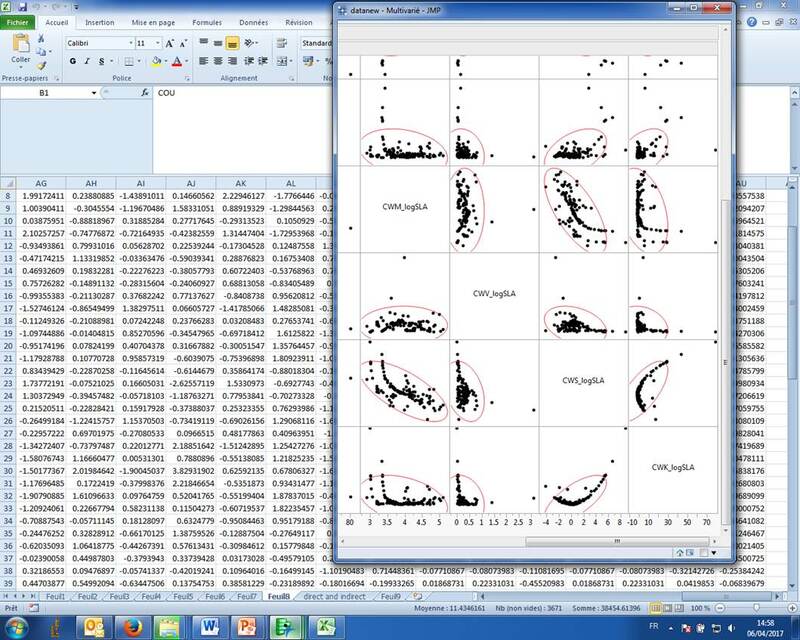 This was the beginning of our paper, so we would like to remind everyone on the importance of plotting raw data! When we started to analyze our data, we were very surprised to observe a strong quadratic relationship between the skewness and the kurtosis of the trait distributions, which was totally unexpected (Figure 2). Since initially we did not know how to interpret this relationship, we contacted a colleague who is a physicist (C. Mañá from CIEMAT in Madrid). He kindly explained us that the skewness-kurtosis relationship allows describing all type of distributions in a constrained statistical universe15 (e.g. Beta, Gamma, Log-normal, Normal distributions). We googled “skewness-kurtosis relationship”, and realized that such a relationship is used in many scientific fields aiming at studying complex dynamic systems such as in geomorphology, climatology, astrophysics, or economy16–19. For instance, this relationship is used as an optimization tool to maximize predictability while minimizing risks in predicting the occurrence of earthquakes, financial crashes or sea surface temperatures. Armed with this information we started to adapt this optimization tool for ecology. We found that trait distributions in global drylands cannot be observed by chance and that the observed skewness-kurtosis relationship was not a mathematical artefact. This empirical relationship predicts that trait diversity is strikingly high in dryland plant communities and was tightly coupled with a maximization of ecosystem functioning. Across a variety of environmental conditions, ecosystem types and species pools (Figure 3), this finding highlights the existence of a general assembly rule that quantifies how much trait diversity is needed to locally maximize multiple ecosystem functions simultaneously (the so-called multifunctionality). Hence, our results clearly indicate that trait distributions could be used to assess the functional consequences of biodiversity loss in terrestrial ecosystems and to guide management efforts aimed at maintaining key ecosystem services linked to productivity and soil fertility. 1.Lawton, J. H. Are there general laws in ecology? Oikos 177–192 (1999). 2.Vellend, M. Conceptual synthesis in community ecology. Q. Rev. Biol. 85, 183–206 (2010). 3.Keddy, P. A. Assembly and response rules: two goals for predictive community ecology. J. Veg. Sci. 3, 157–164 (1992). 4.McGill, B. J., Enquist, B. J., Weiher, E. & Westoby, M. Rebuilding community ecology from functional traits. Trends Ecol. Evol. 21, 178–185 (2006). 5.Weiher, E. et al. Advances, challenges and a developing synthesis of ecological community assembly theory. Philos. Trans. R. Soc. Lond. B Biol. Sci. 366, 2403–2413 (2011). 6.Huang, J., Yu, H., Guan, X., Wang, G. & Guo, R. Accelerated dryland expansion under climate change. Nat. Clim. Change (2015). 7.Prăvălie, R. Drylands extent and environmental issues. A global approach. Earth-Sci. Rev. 161, 259–278 (2016). 8.Reynolds, J. F. et al. Global desertification: building a science for dryland development. science 316, 847–851 (2007). 9.Flombaum, P. & Sala, O. E. Higher effect of plant species diversity on productivity in natural than artificial ecosystems. Proc. Natl. Acad. Sci. 105, 6087–6090 (2008). 10.Maestre, F. T. et al. 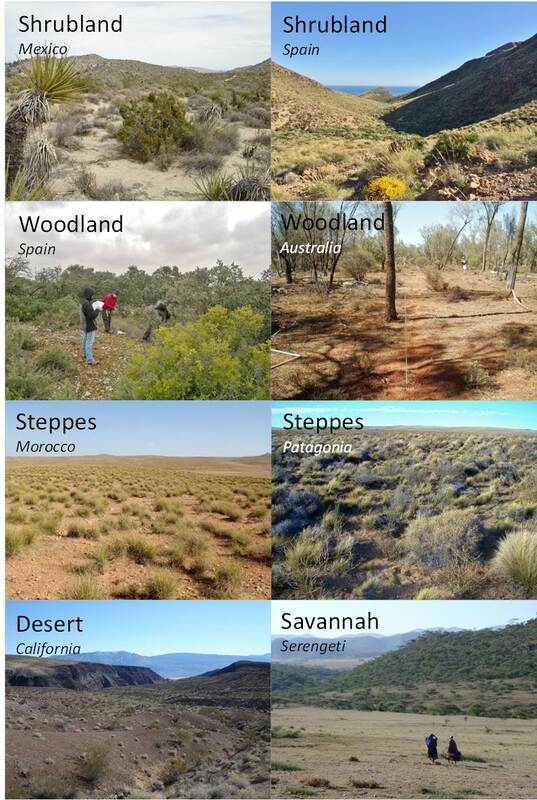 Plant species richness and ecosystem multifunctionality in global drylands. Science 335, 214–218 (2012). 11.Perry, A. L., Low, P. J., Ellis, J. R. & Reynolds, J. D. Climate change and distribution shifts in marine fishes. science 308, 1912–1915 (2005). 12.Díaz, S. et al. The global spectrum of plant form and function. Nature 529, 167–171 (2016). 14.Enquist, B. J. et al. Chapter Nine-Scaling from Traits to Ecosystems: Developing a General Trait Driver Theory via Integrating Trait-Based and Metabolic Scaling Theories. Adv. Ecol. Res. 52, 249–318 (2015). 15.Cullen, A. C. & Frey, H. C. Probabilistic techniques in exposure assessment: a handbook for dealing with variability and uncertainty in models and inputs. (Springer Science & Business Media, 1999). 16.Labit, B. et al. Universal statistical properties of drift-interchange turbulence in TORPEX plasmas. Phys. Rev. Lett. 98, 255002 (2007). 17.Bernardeau, F. Skewness and kurtosis in large-scale cosmic fields. ArXiv Prepr. Astro-Ph9312026 (1993). 18.Cristelli, M. in Complexity in Financial Markets 141–150 (Springer, 2014). 19.Oliver, E. C., Wotherspoon, S. J., Chamberlain, M. A. & Holbrook, N. J. Projected Tasman Sea extremes in sea surface temperature through the twenty-first century. J. Clim. 27, 1980–1998 (2014).